Jane Austen, Sergeant York, Saint Patrick--What did they have in common? Two thousand years and still going strong: that's the story of Christianity. And while the Christian martyrs and saints and orators may have gotten more press, the fact is the faith has been carried through history in the hearts and deeds of believers who--though beloved to us now--were simply living ordinary lives of devotion. "It would be almost impossible to imagine ten people more different from each other than these," editor John Perry says. "This [is] the first truth of Christian living: anybody, anywhere can be a champion of the faith, an example and inspiration to all who follow." There's no dry biography here, though. Each story teems with fresh insight. D. L. Moody did some of his most powerful evangelizing by befriending ragged street children in Chicago. William F. Buckley never delivered a sermon, yet a Christian worldview informed his erudite, witty, output in print and broadcasting. To compose her poems, Anne Bradstreet had to understand science, history, the Bible, and literature, not to mention the political scene in both Massachusetts and England. You'll look with new eyes, also, on the lives of George Washington Carver, Jane Austen, Galileo, Johann Sebastian Bach, Sergeant York, John Bunyan, and Saint Patrick. You might think you know their stories . . . but you don't. 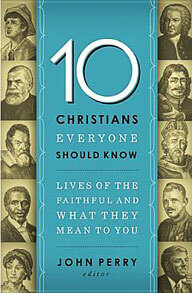 Not yet.For lovers of biography, for homeschool or study groups, for anyone seeking encouragement in the Christian walk, 10 Christians Everyone Should Know is a valuable resource.